[S335] Kathy Wilcox, computer files sent to Roger Bartlett, 25 Nov 1997 (naming Edmund Duffer as his father). [S441] Anneliese Kennedy, Descendants of Isaac Duffer, 1740-1812, online http://www.tngenweb.usit.com/sumner/sumnduff.htm, viewed on 14 Nov 1998, (spelling his name as Edmond and naming Edmund Duffer as his father). [S335] Kathy Wilcox, computer files sent to Roger Bartlett, 25 Nov 1997 (naming Mary _____ as his mother). [S441] Anneliese Kennedy, Descendants of Isaac Duffer, 1740-1812, above, (spelling his name as Edmond and naming Mary _____ as his mother). [S335] Kathy Wilcox, computer files sent to Roger Bartlett, 25 Nov 1997 (naming Polly Gayle as his mother). [S335] Kathy Wilcox, computer files sent to Roger Bartlett, 25 Nov 1997 (naming Elijah Cason as this child's father). [S335] Kathy Wilcox, computer files sent to Roger Bartlett, 25 Nov 1997 (naming Elijah Cason as his father). [S335] Kathy Wilcox, computer files sent to Roger Bartlett, 25 Nov 1997 (naming Elijah Cason as her father). [S335] Kathy Wilcox, computer files sent to Roger Bartlett, 25 Nov 1997 (attributing information to LaVera Jones, Shawnee, Okla.). [S860] Nancy D. Breidenthal, electronic mail to e-mail address, 18 Jul 2003. [S335] Kathy Wilcox, computer files sent to Roger Bartlett, 25 Nov 1997 (naming Lucy Gale Duffer as his mother). [S335] Kathy Wilcox, computer files sent to Roger Bartlett, 25 Nov 1997 (naming Lucy Gale Duffer as her mother). [S209] Edythe Rucker Whitley, comp., Marriages of Wilson County, Tennessee, 1802-1850 (Baltimore, Md. : Genealogical Pub. Co., 1981), p. 116. [S335] Kathy Wilcox, computer files sent to Roger Bartlett, 25 Nov 1997 (naming Elizabeth Duffer as his mother). [S335] Kathy Wilcox, computer files sent to Roger Bartlett, 25 Nov 1997 (naming Elizabeth Duffer as her mother). [S338] 1860 U.S. Census, Rutherford County, Tennessee, schedule 1, Murfreesboro, civil district 13, p. 185, sheet 84, dwelling 1290, family 1285 (indicating that he was born in Virginia in 1813 or 1814). [S209] Edythe Rucker Whitley, comp., Marriages of Wilson County, Tennessee, 1802-1850 (Baltimore, Md. : Genealogical Pub. Co., 1981), p. 117 (spelling his surname as Puffer). [S338] 1860 U.S. Census, Rutherford County, Tennessee, schedule 1, Murfreesboro, p. 4, sheet 156, dwelling 31, family 31 (indicating that he was born in Virginia in 1816 or 1817). [S335] Kathy Wilcox, computer files sent to Roger Bartlett, 25 Nov 1997 (giving the date and county). [S1101] Jill K. Garrett and Iris H. McClain, comps., Some Rutherford County, Tennessee Records (Columbia, Tenn.: n. 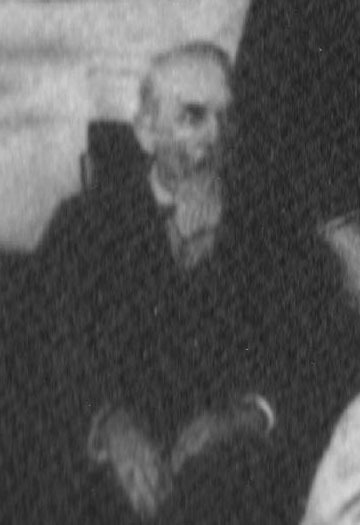 pub., 1971), p. 53, attributing information to unidentified obituary dated 19 Nov 1880. [S338] 1860 U.S. Census, Rutherford County, Tennessee, schedule 1, Murfreesboro, p. 4, sheet 156, dwelling 31, family 31. [S335] Kathy Wilcox, computer files sent to Roger Bartlett, 25 Nov 1997 (naming William C. Duffer as her father). [S335] Kathy Wilcox, computer files sent to Roger Bartlett, 25 Nov 1997 (naming William C. Duffer as his father). [S335] Kathy Wilcox, computer files sent to Roger Bartlett, 25 Nov 1997 (giving her name as Lizza and naming William C. Duffer as her father). [S338] 1860 U.S. Census, Rutherford County, Tennessee, schedule 1, Murfreesboro, p. 4, sheet 156, dwelling 32, family 32 (indicating that he was born in Virginia in 1822 or 1823). [S338] 1860 U.S. Census, Rutherford County, Tennessee, schedule 1, Murfreesboro, p. 4, sheet 156, dwelling 32, family 32. [S335] Kathy Wilcox, computer files sent to Roger Bartlett, 25 Nov 1997 (naming Peter G. Duffer as her father). Repps Osborne Duffer, courtesy of Kathleen Warr. Note*: • He is shown in the 1860 census for Rutherford County, Tennessee as living in Murfreesboro with his family, working as a slave merchant, and owning personal property valued at $5,000. [S338] 1860 U.S. Census, Rutherford County, Tennessee, schedule 1, Murfreesboro, p. 4, sheet 156, dwelling 29, family 29 (indicating that he was born in Tennessee in 1826 or 1827). [S961] Find A Grave, online at http://www.findagrave.com, memorial for Repps Osborne Duffer, memorial no. 37431620, viewed on 18 Jun 2014. [S338] 1860 U.S. Census, Rutherford County, Tennessee, schedule 1, Murfreesboro, p. 4, sheet 156, dwelling 29, family 29. [S961] Find A Grave, online, above, memorial for Repps Osborne Duffer, memorial no. 37431620, viewed on 18 Jun 2014 (second bullet). [S335] Kathy Wilcox, computer files sent to Roger Bartlett, 25 Nov 1997 (naming Repps Osborne Duffer as his father). [S335] Kathy Wilcox, computer files sent to Roger Bartlett, 25 Nov 1997 (naming Repps Osborne Duffer as her father). [S961] Find A Grave, online, above, memorial for James Stinsom Duffer, memorial no. 107693526, viewed on 18 Jun 2014 (naming Repps Osborne Duffer as his father). Joseph F. Duffer's tombstone, Evergreen Cemetery, Murfreesboro, Tenn., by Charles Phipps. • His memorial page on Find A Grave is here. [S338] 1860 U.S. Census, Rutherford County, Tennessee, schedule 1, Murfreesboro, civil district 13, p. 181, sheet 82, dwelling 1252, family 1247 (indicating that he was born in Tennessee in 1828 or 1829). [S961] Find A Grave, online at http://www.findagrave.com, memorial for Joseph F. Duffer, memorial no. 65273419, viewed on 30 Jul 2011. [S336] Margaret B. Scoggins, comp., Banner of Peace and Cumberland Presbyterian Advocate: Abstracts of Marriage, Death, and Other Notices, 1843-1853 (Poplar Bluff, Mo: M. B. Scoggins, 1988), p. 173 (citing issue of 5 Nov 1852, vol. 11, no. 13) (identifying them as Mr.Jo F. Duffer of Wilson County and Miss Missouri Beasley of Smith County). 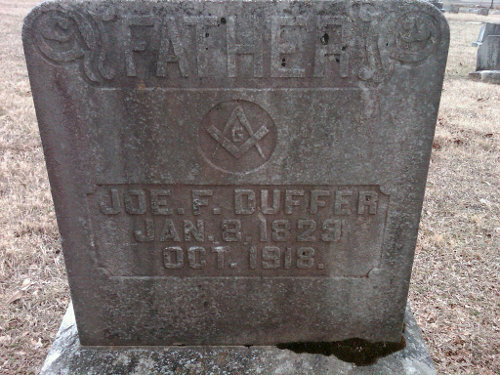 [S961] Find A Grave, online, above, memorial for Joseph F. Duffer, memorial no. 65273419, viewed on 30 Jul 2011 (not giving the date). 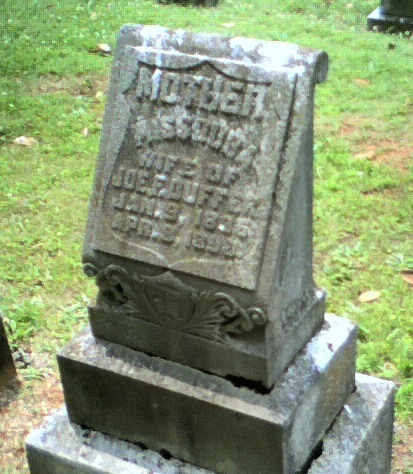 [S961] Find A Grave, online, above, memorial for Missoura Beasley Duffer, memorial no. 65273492, viewed on 30 Jul 2011 (not giving the date). [S338] 1860 U.S. Census, Rutherford County, Tennessee, schedule 1, Murfreesboro, civil district 13, p. 181, sheet 82, dwelling 1252, family 1247. [S335] Kathy Wilcox, computer files sent to Roger Bartlett, 25 Nov 1997 (stating that he died in Oct 1918 in Murfreesboro, Tennessee). [S961] Find A Grave, online, above, memorial for Joseph F. Duffer, memorial no. 65273419, viewed on 30 Jul 2011 (containing a picture of his tombstone indicating a death date of October 1918, although text on the memorial page says he died on 22 Mar 1917). [S335] Kathy Wilcox, computer files sent to Roger Bartlett, 25 Nov 1997 (naming Joseph F. Duffer as his father). [S335] Kathy Wilcox, computer files sent to Roger Bartlett, 25 Nov 1997 (naming Joseph F. Duffer as her father). [S335] Kathy Wilcox, computer files sent to Roger Bartlett, 25 Nov 1997 (naming David Jones as his father). [S335] Kathy Wilcox, computer files sent to Roger Bartlett, 25 Nov 1997 (naming David Jones as her father). [S335] Kathy Wilcox, computer files sent to Roger Bartlett, 25 Nov 1997 (naming Vincent Lester as his father). [S335] Kathy Wilcox, computer files sent to Roger Bartlett, 25 Nov 1997 (naming Vincent Lester as her father). [S338] 1860 U.S. Census, Rutherford County, Tennessee, schedule 1, Murfreesboro, civil district 13, p. 185, sheet 84, dwelling 1290, family 1285 (indicating that she was born in Tennessee in 1823 or 1824). [S335] Kathy Wilcox, computer files sent to Roger Bartlett, 25 Nov 1997 (naming Elmira Hancock as her mother). [S338] 1860 U.S. Census, Rutherford County, Tennessee, schedule 1, Murfreesboro, p. 4, sheet 156, dwelling 31, family 31 (giving her name as Fanny and indicating that she was born in Tennessee in 1821 or 1822). [S335] Kathy Wilcox, computer files sent to Roger Bartlett, 25 Nov 1997 (naming Frances Fletcher as her mother). [S335] Kathy Wilcox, computer files sent to Roger Bartlett, 25 Nov 1997 (naming Frances Fletcher as his mother). [S338] 1860 U.S. Census, Rutherford County, Tennessee, schedule 1, Murfreesboro, p. 4, sheet 156, dwelling 32, family 32 (indicating that she was born in Tennessee in 1825 or 1826). [S335] Kathy Wilcox, computer files sent to Roger Bartlett, 25 Nov 1997 (naming Susan Lipscomb as her mother). [S335] Kathy Wilcox, computer files sent to Roger Bartlett, 25 Nov 1997 (naming Bettie _____ as her mother). [S335] Kathy Wilcox, computer files sent to Roger Bartlett, 25 Nov 1997 (naming Mildred Willis as his mother). [S335] Kathy Wilcox, computer files sent to Roger Bartlett, 25 Nov 1997 (naming Mildred Willis as her mother). Missoura Beasley Duffer's tombstone, Evergreen Cemetery, Murfreesboro, Tenn., by Lori Parker. [S335] Kathy Wilcox, computer files sent to Roger Bartlett, 25 Nov 1997 (giving only the date). [S338] 1860 U.S. Census, Rutherford County, Tennessee, schedule 1, Murfreesboro, civil district 13, p. 181, sheet 82, dwelling 1252, family 1247 (indicating that she was born in Tennessee in 1836 or 1837). [S961] Find A Grave, online at http://www.findagrave.com, memorial for Missoura Beasley Duffer, memorial no. 65273492, viewed on 30 Jul 2011. [S335] Kathy Wilcox, computer files sent to Roger Bartlett, 25 Nov 1997 (naming Missoura Beasley as his mother). [S335] Kathy Wilcox, computer files sent to Roger Bartlett, 25 Nov 1997 (naming Missoura Beasley as her mother). [S335] Kathy Wilcox, computer files sent to Roger Bartlett, 25 Nov 1997 (naming Isaac Duffer as his father). [S441] Anneliese Kennedy, Descendants of Isaac Duffer, 1740-1812, online http://www.tngenweb.usit.com/sumner/sumnduff.htm, viewed on 14 Nov 1998, (naming Isaac Duffer as his father). [S441] Anneliese Kennedy, Descendants of Isaac Duffer, 1740-1812, above, (naming Mary _____ as his mother). [S441] Anneliese Kennedy, Descendants of Isaac Duffer, 1740-1812, above, (stating that he was born after 1754). [S441] Anneliese Kennedy, Descendants of Isaac Duffer, 1740-1812, above. [S441] Anneliese Kennedy, Descendants of Isaac Duffer, 1740-1812, above, (spelling his name as Edmond and naming Edmund Duffer as his father). [S1204] Ethel Taylor Ford, Thomas Taylor and Benjamin Branch of Nashville, Tennessee, and Related Families (Amarillo, Tex. : n. pub., 1972? ), p. 59 (naming Edmund Duffer as his father). [S441] Anneliese Kennedy, Descendants of Isaac Duffer, 1740-1812, online http://www.tngenweb.usit.com/sumner/sumnduff.htm, viewed on 14 Nov 1998. [S335] Kathy Wilcox, computer files sent to Roger Bartlett, 25 Nov 1997 (naming Mary _____ as her mother). [S441] Anneliese Kennedy, Descendants of Isaac Duffer, 1740-1812, above, (naming Isaac Duffer as his father). [S441] Anneliese Kennedy, Descendants of Isaac Duffer, 1740-1812, above, (stating that she died in Kentucky after 1787 but not naming the county). [S331] David Patton, electronic mail to e-mail address, 19 Nov 1997. [S335] Kathy Wilcox, computer files sent to Roger Bartlett, 25 Nov 1997 (naming Isaac Duffer as her father). [S335] Kathy Wilcox, computer files sent to Roger Bartlett, 25 Nov 1997 (naming Nancy Scott as his mother). [S335] Kathy Wilcox, computer files sent to Roger Bartlett, 25 Nov 1997 (naming Nancy Scott as her mother). [S335] Kathy Wilcox, computer files sent to Roger Bartlett, 25 Nov 1997 (naming Asa Duffer as his father). [S335] Kathy Wilcox, computer files sent to Roger Bartlett, 25 Nov 1997 (naming Asa Duffer as her father). [S335] Kathy Wilcox, computer files sent to Roger Bartlett, 25 Nov 1997 (naming Mary Williamson as his mother). [S335] Kathy Wilcox, computer files sent to Roger Bartlett, 25 Nov 1997 (naming Mary Williamson as her mother). [S353] Edythe Rucker Whitley, comp., Marriages of Sumner County, Tennessee, 1787-1838 (Baltimore, Md. : Genealogical Pub. Co., Inc., 1981), p. 58 (spelling his first name as Auston). [S335] Kathy Wilcox, computer files sent to Roger Bartlett, 25 Nov 1997 (naming Austin Duffer as her father). [S335] Kathy Wilcox, computer files sent to Roger Bartlett, 25 Nov 1997 (naming Austin Duffer as his father). [S335] Kathy Wilcox, computer files sent to Roger Bartlett, 25 Nov 1997 (naming Austin Duffer as this child's father). [S335] Kathy Wilcox, computer files sent to Roger Bartlett, 25 Nov 1997 (naming Elizabeth Rawlins as her mother). [S335] Kathy Wilcox, computer files sent to Roger Bartlett, 25 Nov 1997 (naming Nancy Gregory as his mother). [S335] Kathy Wilcox, computer files sent to Roger Bartlett, 25 Nov 1997 (naming Sally Hunt as this child's mother). [S335] Kathy Wilcox, computer files sent to Roger Bartlett, 25 Nov 1997 (naming Sally Hunt as her mother). [S335] Kathy Wilcox, computer files sent to Roger Bartlett, 25 Nov 1997 (naming Sally Hunt as his mother).